Vagrant. There is one nineteenth century record from Waterford. The identity was confirmed by the leading expert of the time. It is unlikely that such a distinctive species remains undetected in Ireland. 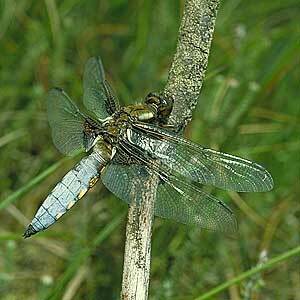 The Broad-bodied Chaser in Britain is found in well-vegetated still water including garden and farm ponds. Adults fly from mid May to early August. Mature (blue abdomen) males may sometimes be confused with males of the Black-tailed Skimmer Orthetrum cancellatum, however the latter has a much narrower abdomen and there is no dark patch at the wing-base. Immature males and females (yellowish-brown abdomen) are similar to the Four-spotted Chaser Libellula quadrimaculata but the latter has a much narrower abdomen and a dark patch in the middle of the leading edge of each wing. Broad, flattened abdomen which is pale blue in males and yellowish-brown in females and immature males. Yellow spots along sides of abdomen. Brown patch at base of wings. No brown spot on the middle of the leading edge of the wings.